$219,000 for a 1994 Jaguar Two-Door! Get ready to let the cat out of the bag with a 550 HP Jaguar super car that's rarer than a working Lucas ignition system. Here kitty, kitty, kitty. You can count the number of mid-engine Jaguar models on one hand. And that's even if you're missing a finger or two. The XJ13 of 1965-66, the XJR-9/15 of the late ‘80s, and today's Nice Price or Crack Pipe candidate- the XJ220. In the mid 1980s, Jaguar's chief engineer, Jim Randle, saw competitors' halo cars emerging on the market, and felt Jaguar should follow suit. The vision was for a Lightweight two-seat coupe with unmistakable Jaguar genes in its appearance, and an unrivaled top speed. The resultant XJ220 debuted at the 1988 British Motor Show to universal acclaim, and it was announced that the now-fat cat would go into limited production. Eager buyers put down deposits based on the show car, which had a 6.2 litre DOHC V12, upward rising doors, and Ferguson all-wheel drive. Due to development cost constraints, the production XJ220 ended up with the TWR-engineered twin turbo V6 from the Rover Metro 6R4 rally car, and sans the scissor doors or all-wheel drive. Those who had made deposits on the car were compensated for the loss of 6 cylinders, 2 driving wheels and Lambo doors with a significantly higher price tag- $650,000 or about 10% more than initially quoted. Despite this bumpy launch, TWR managed to squeeze out over 280 of the cars (Pininfarina designed one later on for the Sultan of Brunei) for Jaguar. The amazing bodywork is also remarkably efficient, allowing for a top speed of 215 mph, and providing articulating front and rear air control surfaces to help keep the shiny side up. In 1993, the competition version- the XJ220C- won the then newly created GT class at LeMans, and the street version held the production car top speed crown until the McLaren F1 knocked it off the pedestal in 1994. This particular example is claimed to have been DOT/EPA certified in California, which is no small feat. It has 2,891 miles on the clock, and has a presence that is undeniable. But unlike, say, a Ferrari, there's a lack of universal iconic identification that tells the plebeians, as you pass them by, that this is a dramatically unique and valuable ride. And therein lies the rub, as Shakespeare most eloquently posited. 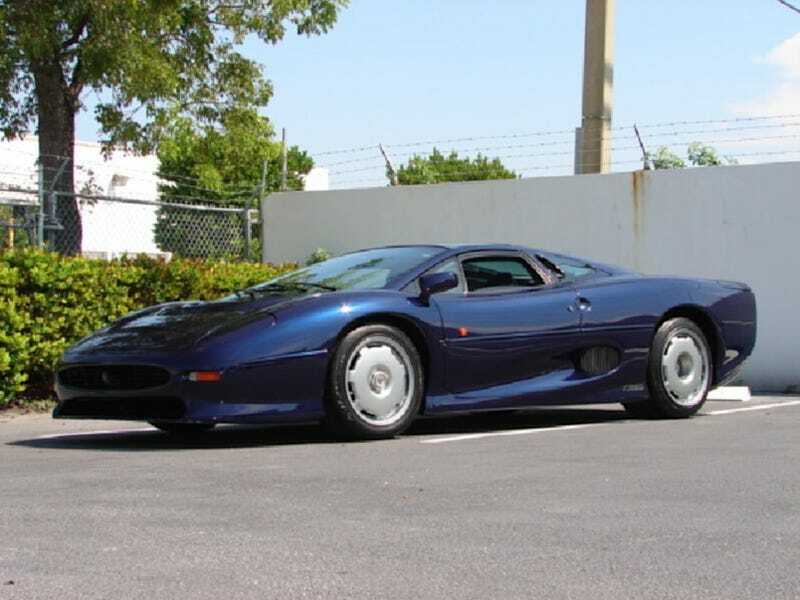 So are you a feline fancier who thinks $219,000 for an XJ220 is the cat's pajamas? Or does asking that much for a Jag make you want to cough up a hair ball?